Piaggio Aero and Selex ES announced at the Dubai Airshow that the first flight of the P.1HH HammerHead Demo unmanned aircraft system (UAS) technology demonstrator took place on November 14 at Trapani air force base in Italy. The demonstrator took off at 110 knots rotation speed and flew over the Mediterranean Sea for approximately 12 minutes while being remotely piloted from a ground-control station. The flight was conducted with the aircraft in mid-flap configuration, with landing gear extended, with it reaching an altitude of 2,000 feet and a speed of 170 knots. Piaggio Aero (Stand 1906, Static P3) unveiled the P.1HH HammerHead UAS, a derivative of its P.180 Avanti II twin turboprop, at the Paris Air Show in June. The manufacturer is developing the aircraft as a medium altitude, long endurance (MALE) UAS designed for intelligence, surveillance and reconnaissance missions. At the Dubai Airshow on Monday, Piaggio Aero presented a video of the first flight at the exhibit space it shares with Abu Dhabi’s Mubadala Development Company, which owns a 41-percent interest in Piaggio. A high-level audience attended the showing, including Italian Air Force chief of staff Lieutenant General Pasquale Preziosa; Italy’s undersecretary of defense Senator Roberta Pinotti; Piaggio Aero CEO Alberto Galassi; Mubadala CEO HE Khaldoon Khalifa Al Mubarak; and Homaid Al Shemmari, Mubadala executive director of aerospace, communications technology and defense services. Galassi said there is no current requirement by the UAE armed forces for the HammerHead UAS. “First of all we need to certify it, and the Italian Air Force will,” he said. “Then it is designed to be a NATO program and then we’ll see what other countries are interested.” The level of commitment to the program by the Italian Air Force, which is the certifying authority for the aircraft, is “very strong,” he added. The P.1HH HammerHead is powered by twin Pratt & Whitney Canada PT6A-66B turboprop engines. It is designed to operate to a service ceiling of 45,000 feet and stay aloft for 16 hours with a 500-pound payload, or fly to a maximum range of 4,400 nm. The vehicle control and management system (VCMS), air data terminal and ground-control segment were developed and supplied by Selex ES (Stand 1933), which also provides the mission-management system. Based on its skyISTAR system, this fuses data from on-board sensors for display to the operator. Main sensors are the Selex ES SeaSpray 7300E active electronically scanned array (AESA) surveillance radar and the FLIR Systems StarSafire 380HD electro-optic/infrared sensor. The P.1HH Demo first test flight was mainly intended to validate the aircraft’s remote VCMS. “The flight controls were very good and behaved as expected,” Antonio Maglione, Piaggio Aero chief technical officer, told AIN. “We also have to consider that we used not only direct modes but also automatic modes. Also we introduced some automatic functions–auto braking, balanced braking. We know the P.180 is very fast and lands at a significantly higher speed than the Predators or other unmanned aircraft, so we took care a lot about the ground phases that we consider very critical for this aircraft.” Maglione said the demonstrator would fly again before the end of the year. The demonstrator completed ground tests and performed low-speed runway taxiing for the first time on February 14. On August 8, “silently and without any formal announcement,” the P.1HH Demo flight testbed lifted off for the first time and performed a short level flight while being remotely piloted. The first flight marks the beginning of the next phase of development of the P.1HH HammerHead UAS program, leading to planned operational readiness by the end of 2014. 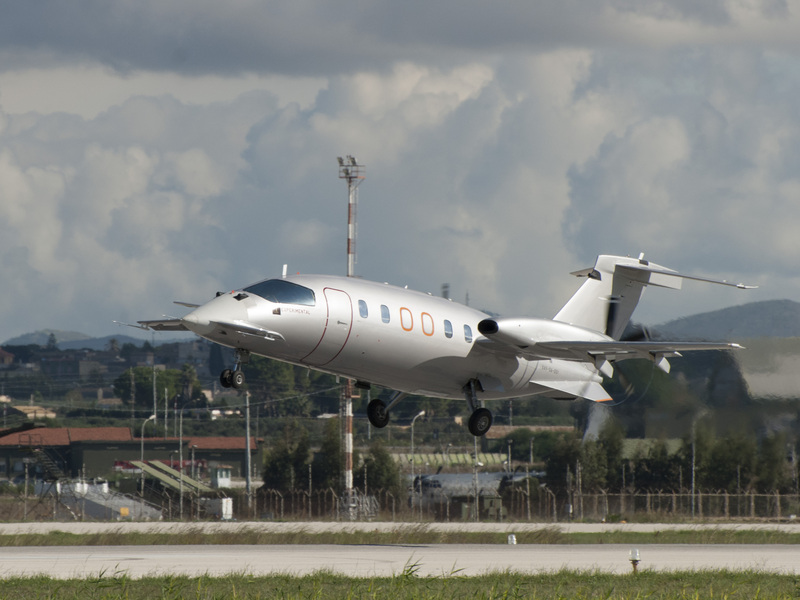 Piaggio Aero expects the aircraft will enter service in 2015.